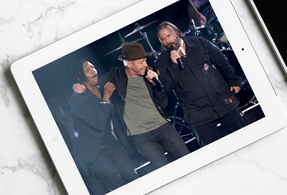 NASHVILLE, Tenn. (September 7, 2018) – The Gospel Music Association (GMA) announced another round of all-star performances for the 49th Annual GMA Dove Awards, including award-winning singer-songwriter Lauren Daigle, a Newsboys reunion celebrating the band’s 25th anniversary, a duet by chart-topping recording artist Natalie Grant and rising star Koryn Hawthorne, and a first-time Dove Awards performance by GRAMMY® nominated artist Tori Kelly featuring gospel legend Kirk Franklin. The 49th Annual GMA Dove Awards are made possible in part by Christian Healthcare Ministries (CHM), the nation’s original health cost sharing ministry. “We support the Dove Awards because of the importance in our society of Christian artists sharing the Good News,” said Rev. Dr. Howard S. Russell, CHM president and CEO. “The role of Christian artists’ in encouraging the spirits of believers directly impacts listeners’ spiritual and physical well-being. We support the work of Christian artists in uplifting the kingdom of God.”The GMA Dove Awards celebrate the contributions of artists from every style of Christian/Gospel music. Nominees are determined by GMA’s professional members, and winners will be voted on by the entire GMA membership. Tauren Wells leads artist nominations with eight, followed by Zach Williams with six and Cory Asbury, Tasha Cobbs Leonard and TobyMac with five nods each. Top nominated writer/producer Colby Wedgeworth scored eight nominations. View the full list of nominees HERE.